This year is starting to feel like an embarrassment of riches for RPG fans who own the Nintendo 3DS. Fire Emblem is out, Pokemon X/Y and Shin Megami Tensei: Soul Hackers are on the way, and now we've got Etrian Odyssey 4: Legends of the Titan. Admittedly, Etrian Odyssey is not a series that I would necessarily recommend to everyone. It has a history of being very tough, and its story (such as it is) is on the sparse side. But despite looking much the same as the original Nintendo DS games, changes are afoot with Etrian Odyssey 4, many of them for the better. The most important change, arguably, is that it's easier. A lot easier. Not that it's overly simple or anything; but compared to the first three games, the opening areas are a breeze. This is good, because Etrian Odyssey long delighted in simply tossing players into its trademark labyrinths, then watching them die. This way, at least, newcomers have a chance to see what really makes Etrian Odyssey great. And make no mistake, Etrian Odyssey 4 is great. Like its predecessors, it is a deep first-person RPG that hearkens back to the earliest days of PC gaming, when we were still sketching out clumsy maps on graph paper. It even comes with its own touchscreen-driven map, which often requires scrupulous notation to avoid, say, walking into a wall of icicles. 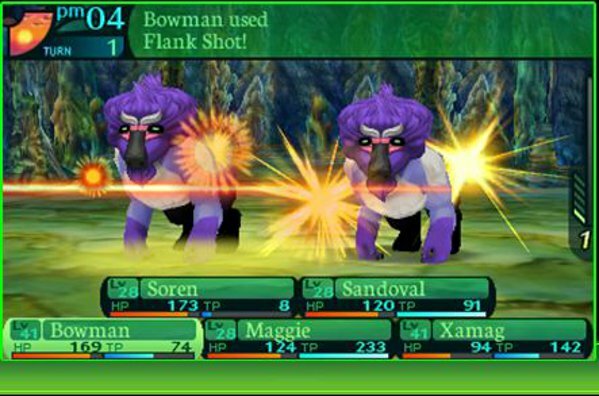 Party members are mostly generic characters recruited to a party guild, with their names, character art, and skill trees among the elements that can be customized. The mechanics have always been rather simple – it's a menu-based RPG in which you delve as deep into a series of labyrinths as possible before coming up for air to heal and sell your loot. The appeal has always been in figuring out class combinations – all of which feature skill trees with lots of options – and its raw challenge. It's those elements that have earned it an intense, but relatively niche, following. With Etrian Odyssey 4, however, there are signs that the series is softening a bit. It's not nearly as impenetrable thanks to a significantly reduced difficulty curve. No longer are you asked to simply wander into the local labyrinth with your party of level 1 adventures and pray. What amounts to a tutorial dungeon offers players an opportunity to level up and get a firm grasp of all the character classes, the upshot being that everyone – new players and returning fans – feel more comfortable tackling the powerful monsters down the road. There's also some storytelling to be found, and even a bit of genuine character development outside of the usual gang of bartenders and shopkeeps hanging around town, most of it revolving around wandering adventures and characters discovered deep within the labyrinths. More impressively, Etrian Odyssey 4 does all this without losing its edge as a dungeon crawler, which is all down to the impressive balance that is exhibited throughout the quest. Enemies will unleash all manner of status effects, brutal multiple-hit attacks, and debuffs, especially later on. It just doesn't happen all at once. There's no longer a sense of being snowed under in the second level of the first maze. One of Etrian Odyssey 4's biggest new additions is the airship, which is used to traverse and chart a series of world maps. Each map has its own major labyrinth, which must be conquered to continue onward, as well as a series of optional dungeons to explore at your leisure. Trust me when I say that you will want to brave these optional dungeons, because you won't be prepared to take on the later bosses if you don't. Inevitably though, you will want to visit these extra dungeons anyway, because the treasure therein is just too lucrative to pass up. Not only that, they imbue EO4 with a definite sense of momentum. Running afoul of some terrible F.O.E. – frighteningly powerful minibosses that roam the halls of Etrian Odyssey's labyrinths – used to be a reason to put away my DS for a while, mainly because it meant time-consuming grinding in the labyrinth. In Etrian Odyssey 4, however, you can simply pick up stakes in your airship and start wandering instead. Inevitably, you will find another dungeon to explore, or a more manageable F.O.E. that yields lots of experience, and you will be right back on your way. In short, the grind isn't nearly as intense in EO4 as it has been in previous entries, which does its part to significantly lower frustration. As for Etrian Odyssey's transition from the DS to the 3DS, it doesn't feel like a huge leap forward, at least not at first. Probably the coolest new feature is being able to download another player's Guild and add one of their characters to your own party, albeit without the ability to level them up or change their skills or equipment. In the grand scheme of things, it's relatively minor, but it's nice to have nevertheless. Beyond that, it looks much the same as it always has, albeit with animated monsters instead of 2D sprites. Your mileage will vary on this front; I think I liked the old sprites better. For series fans, it's also worth debating the inclusion of the new classes, which replace the more unconventional choices of the previous game (farewell, Farmer). Of them all, probably the best is the Archanist, who uses debuffs and other debilitating spells to keep enemies on their toes. The Nightseeker, meanwhile, is capable of doing some pretty insane damage with dual-weapon attacks and binding abilities. The new classes offer a fairly broad mix, and I will admit I spent almost as much time obsessing over my team composition as I did the actual exploration. Overall, the new classes are well-balanced and relatively easy to understand, which ought to be a boon for newer players. Of them all, only the bow-wielding Sniper felt weak, though it sounds like their critical hit skills can be pretty fierce. In general, Etrian Odyssey 4's mantra seems to be, "Make it bigger, make it more accessible, but don't lose the core fans." In that, I think it's fair to say that Atlus has succeeded. I've always had a healthy respect for the series, but I wouldn't say that its brand of brutal dungeon crawling was really my cup of tea. In part because of the more balanced difficulty – and a new casual mode that blunts some of the consequences of death by whisking you directly back to town – this is the most fun I've had with an Etrian Odyssey game in ages. That's no small feat. For that reason, I have no problem recommending Etrian Odyssey 4 as one of the two best RPGs on the Nintendo 3DS (the other being Fire Emblem). It's big, it's deep, and for once, it's accessible. That's more than enough reason to go and discover what has been, to this point, one of Atlus' best kept secrets. This review is based on a retail copy of Etrian Odyssey IV, provided by Atlus.